Earlier this month, I came across a rather exciting website for the Atari ST called Stonish, by Bruno Mathieu / aka ‘Brume’which attempts to feature every “Menu CD” ever made. Quite the task, I'm sure you'll agree! Many are extremely rare and some are probably lost forever so I feel this website is absolutely essential. 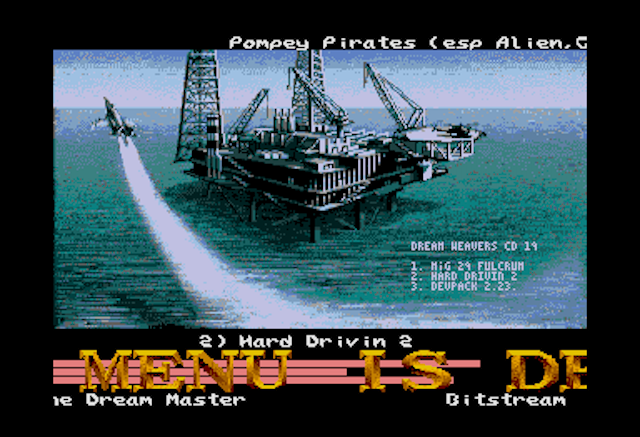 "Stonish.net tries to collect all menu disks made on Atari ST. They are mainly games menus, but it will feature tools, demos and mod menus in the next months. The site provides more than 1600 disks at the moment (more to come). All disks have been tested and some of them have been repaired. The goal is, of course, to provide a safe database for all disks, but not only. Some crews didn't spread very well their disks. A lot of compilations have been lost since the 80's. So we need to fill the gap: any help is welcome ;) This is the first of the website, which will probably evolve in the next months." 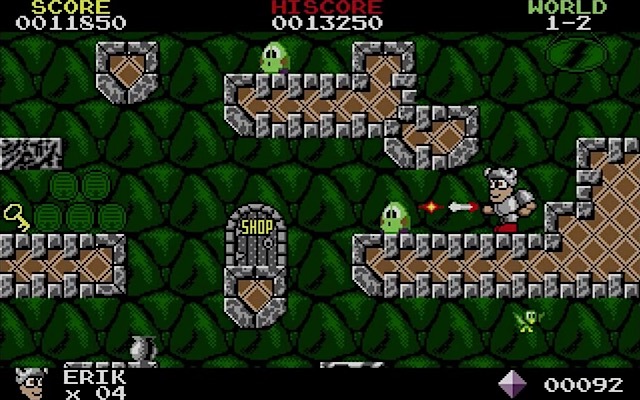 The Curse Of Bolda is a scrolling platformer developed by Ben Pritchard for FloppyShop's platinum range. Kevin is the star once again and he's got five large levels to explore with each one split into three stages. The first two stages are free-roaming worlds with which to collect jewels, shoot monsters and solve basic puzzles such as opening locked doors and operating platforms. Tools can be collected and (using the function keys) can provide a variety of uses - like a jetpack!! The final third stages are an automated arena where Kevin must manoeuver through the hazards, collecting yet more jewels until he reaches the big-bad scary rock demon, Bolda! This is a great platformer but poor old STOS struggles to deliver fast scrolling on a stock 8Mhz computer so set your emulator to 16Mhz. Better still, play using a Mega STe, Falcon or an upgraded ST for the ultimate experience which will be perfect as if the game was specifically designed for the extra clock cycles. Also, STfm/STe peeps will enjoy sweet chip music during gameplay but lucky STe dudes also get sampled effects using the DMA hardware. The Curse Of Bolda is a good platformer that offers many hours of enjoyment and I've really enjoyed it [on my Mega STe]. Update: thanks to the kindness of Ben Pritchard, the full version is now available for free! This isn't a review. I simply needed to vent about this awesome shoot 'em up which many Atari ST gamers seem to hate. I admit, Psygnosis has given us ST nutters more than our fair share of lazy ports but many include Menace in their rants. And this is something I strongly disagree with albeit with that odd yellow ship!! Menace scrolls along perfectly with large sprites and colourful scenery against the dead of space as a background. Sound effects are darn cool and we have gorgeous David Whittaker chiptunes which instantly get you tapping your feet. Controls are responsive and precise with gameplay that is fast, smooth and bucket loads of fun. This is an extremely addictive shooter with that "just one more go" appeal. Fantastic game!! 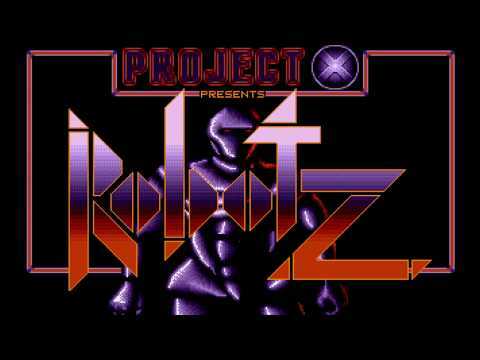 Cybernoid is a game developed by a legend. Someone who repeatably rocked the 8-bit world, Raffaele Cecco. I was a Spectrum owner back then and it seemed everyone was crazy about him and his games, rightly so. However, there have been too many dodgy 16-bit conversions so I was more than a little dubious upon first loading up Cybernoid. The 16-bit conversion was handled by Tony Cooper and is amazing. Offering (almost) the same level of thrills as the original, its gameplay is smooth with comfortable controls which are responsive throughout each of the spruced-up screens. Yes, graphically, this is head and shoulders above the original Speccy game with eye-popping colours and lovely animations. The sound effects are a joy, accompanied by a fantastic chiptune. However, this is one tough cookie. No, it's a damn tough nut cookie!! It will take most gamers many attempts to master its cruel playability. It's especially annoying when enemies can seem to fire their weapons through solid walls or objects. But stick with it because Cybernoid is awesome, almost as good as the original and ultra addictive. Crack the cunning learning curve and you've got yourself a wonderful and challenging game! I never really understood was the whole pinball thang but that didn't stop me from buying Obsession back in the day. It features various Atari STe enhancements that were largely ignored by the commercial industry, like hardware scrolling, DMA stereo sounds and overscan too. This is a cracking game, a perfect 10/10. Download! Erik is a kind and peaceful Viking who happens to keep himself to himself and bothers nobody. Unfortunately, that evil god Loki isn't too pleased about Erik choosing a pacifistic lifestyle over one of pillaging so he casts a spell and turns the world rotten. Erik must now travel these infested lands and battle all kinds of sadistic evil before he can return home. Wow, the problems computer characters must face on a daily basis... It's just not fair, is it? Atlantis Software released Erik back in 1992 and its a vertically scrolling platformer that features dozens of levels spread over four worlds. 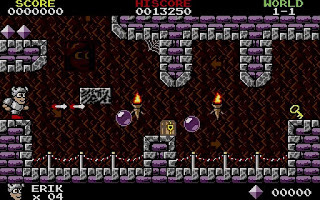 Of course, each level contains a fair few baddies, cool traps and scary end of level bosses. The graphics are cute and cuddly with nice detail and super smooth scrolling with raspy samples for sounds. Overall, this is a really simple platformer with little to complicate it. Okay, Erik isn't exactly original but it is entertaining and soon gets very challenging. A downright nifty platformer which is guaranteed to be lots of fun. Floppy disks can be found over on AtariMania whilst Klaz has a great hard disk version!